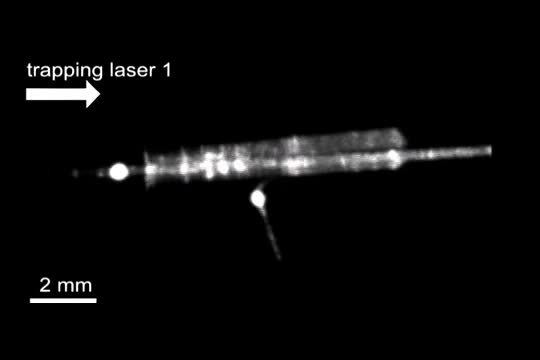 For the first time, researchers have optically trapped and propelled a particle-based laser for centimeters inside an optical fiber. The new flying microlaser enables highly sensitive temperature measurements along the length of the fiber and could offer a novel way to precisely deliver light to remote and inaccessible locations. "The flying microlaser could potentially be used to deliver light inside the body," said Richard Zeltner of the Max Planck Institute for the Science of Light, Germany. "By inserting a fiber into the skin, a microlaser emitting at a suitable wavelength could deliver precisely positioned light for use with light-activated drugs. The concept could also be applied in optofluidic lab-on-a-chip devices to provide a light source for various bioanalysis techniques or for on-chip temperature measurements with high spatial resolution." In The Optical Society (OSA) journal Optics Letters, researchers led by Philip St.J. Russell reported that the flying microlaser can perform position-resolved temperature sensing with a spatial resolution on the order of millimeters. This demonstration showed the flying microlaser's usefulness for distributed sensing, an approach that performs real-time continuous sensing along an optical fiber. The flying microlaser is based on a whispering gallery mode resonator, a small particle that confines and enhances certain wavelengths of light. The name comes from the fact that the light waves travel around the curved inner surface of these particles in the same way that the acoustic waves travel around curved surfaces such as the whispering gallery in St. Paul's Cathedral, allowing whispers to be clearly heard from the other side of the gallery. A critical component for creating the flying microlaser was a special type of fiber known as hollow-core photonic crystal fiber. As the name implies, this fiber features a central core that is hollow rather than solid glass like traditional optical fibers. The hollow core is surrounded by a glass microstructure that confines light inside the fiber. 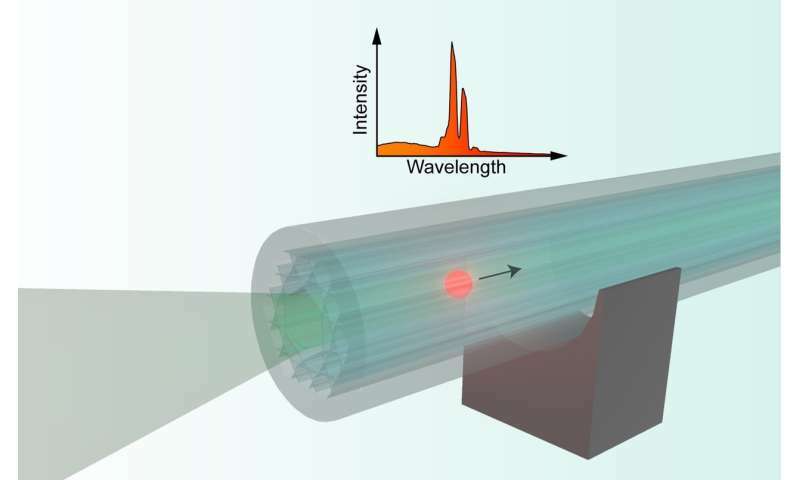 "For quite some time, our research group has been developing the technology necessary to optically trap particles inside hollow-core photonic crystal fibers," said Shangran Xie, a member of the research team. "In this new work, we were able to apply this technology not just to trap a particle but also to induce it to act as a laser that can be used for sensing over long distances in a fiber." To create the flying microlaser, the researchers launched laser light into a water-filled hollow core fiber to optically trap the microparticle. Like the materials used to make traditional lasers, the microparticle incorporates a gain medium. The researchers excited this gain medium using a second laser beam, causing the microparticle to emit light, or lase. The particle position along the fiber is controlled using optical forces generated by the trapping laser or by introducing a flow of water inside the core. To test the new system's ability to sense temperature changes, the researchers propelled the lasing microparticle along two regions of the fiber heated to 22 degrees Celsius above room temperature. By measuring shifts in the lasing wavelengths emitted from the microparticle, they could precisely detect changes in temperature as the microlaser moved through the fiber. The sensor detected temperature changes of just under 3 degrees Celsius and provided a spatial resolution of a few millimeters. Using a technique called laser Doppler velocimetry, the researchers determined that the particle moved at a speed of 250 microns per second during the experiment. They say that using a fiber filled with air rather than water could increase the propulsion speed to centimeters or even meters per second. Although the microparticles used in the experiment tend to lose their ability to lase after about a minute due to photobleaching, the researchers say that microparticles with different gain materials could solve this problem. They are also exploring whether multiple microlasers could be manipulated inside the fiber simultaneously and are working on improvements of the particle position detection scheme. "With the increasing commercialization of hollow-core photonic crystal fibers, all the technology we need to turn this system into a practical sensor is already available," said Zeltner.